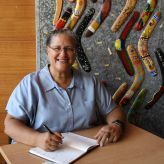 Dr Stephanie Gilbert, Coordinator of Teaching Quality and Development at The Wollotuka Institute, is set to put an international perspective on her research after she was awarded a prestigious Fulbright Scholarship. Stephanie will use her Fulbright Scholarship to examine the possibility that trauma can become embedded in our bodies in such a way it can be transmitted across generations. Exploring ‘soul wounds’ and body dysphoria Stephanie will take these concepts into the broader, International context. For her Fulbright Scholarship, Stephanie will travel to the US for six months to work with a range of academics from research groups and institutions such as University of California (Santa-Cruz) and University of Washington’ Indigenous Wellness Research Institute.